There is an important life-threatening consequence of diabetes that involves the use of artificial sweeteners that deserves special attention. 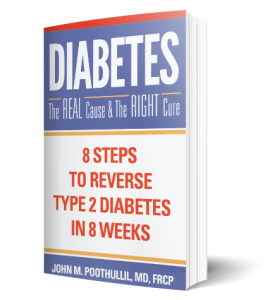 One of the complications of Type 2 diabetes, beyond having high blood sugar, is that it typically raises the level of fats (triglycerides and cholesterol) in the blood stream. These fats can attach to the lining of blood vessels, which can cause the interruption of blood flow to limbs (leading to amputations), as well as to the heart (leading to a heart attack) and to the brain (leading to a stroke). How diabetes causes this clogging of the interior of blood vessels has been the subject of much research. It is known that in order for triglyceride or cholesterol to stick to a blood vessel, there has to be damage to the smooth contour of its interior. But where does that damage come from? A new study by researcher Brian Hoffman presented at the 2018 Experimental Biology meeting in San Diego showed that this damage can develop following the attachment of glucose molecules to proteins of cells lining the interior of blood vessels. Diabetics have high blood glucose levels, thus a propensity to create this damage. However, what is critical to understand is that the same study found that artificial sweeteners—including aspartame and acesulfame potassium—also produced a similar disruption to the interior of blood vessel through a different mechanism. The study suggests that diabetics could suffer from the cumulative damage of both effects if they do not control their high blood sugar and use artificial sweeteners. Let me add that there is little scientific rational to substitute artificial sweeteners for natural sugar to lose weight. 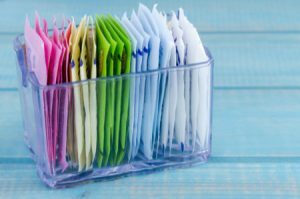 A report published in the 2017 Canadian Medical Association Journal summarized the analysis of 37 studies on artificial sweeteners to see if they were successful for weight management. The studies followed more than 400,000 people for about 10 years. The conclusion: artificial sweeteners did not appear to help people lose weight. Instead, people who regularly consumed them had a higher risk of weight gain, obesity, diabetes and heart disease. Furthermore, using artificial sweeteners in foods and beverages tends to jeopardize the brain’s ability to detect sweetness. According to researcher Susan Swithers in a 2013 article in Trends in Endocrinology and Metabolism, consuming sweet tasting but noncaloric or reduced-calorie items interferes with our learned responses that normally help us control our intake of glucose-rich foods. Given the above, it is critical that the American Dietetic Association change its position regarding artificial sweeteners. In 2004, the ADA stated that “consumers can safely enjoy a range of nutritive and nonnutritive sweeteners.” This must be changed to warn that “there is potential danger from consumption of artificial sweeteners”. Entities such as the American Diabetes Association and American Association of Diabetes Educators should equally warn those who have high blood sugar to immediately stop using artificial sweeteners so as not to add to their risks of life-threatening diabetes complications.